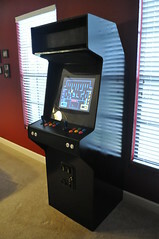 I bet there is not a techie anywhere that has not seen a Multiple Arcade Machine Emulator (MAME) cabinet and not wanted one. Building one is somewhat akin to earning an eagle scout badge, in the world of geekdom. 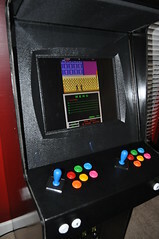 For those of you who’ve never heard of a MAME cabinet; it is a PC built within a normal looking arcade cabinet, running a specialized piece of software which “emulates” the old hardware of real arcade machines. This emulator allows the actual ROMs from arcade games to be loaded and run, in all their 8-bit glory. Apparently MAME’ers like to brag and gloat, because there are a ton of information online about MAME cabinet projects, because . While the best source of information is Arcade Controls.com, it was Chris Moyles’ “The Story of a Cabinet Built in 24 hours” that gave me the itch. I’ve wanted to build this for quite a few years, but I finally got to a point where I have a space for it and the spare computer hardware that perfectly meets the needs of a full size cabinet. 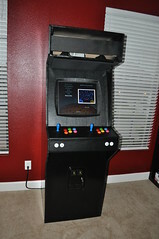 After a little research, I sketched up a cabinet, ordered my controls and set off my my own MAME project. After two full days of torrential downpours, I was finally able to make a quick run to Lowes to pick up my MDF. I transferred my sketch to wood, made a few adjustments then started cutting. After nearly 10 hours of work (This was the only full day I could dedicate to the cabinet) and a garage (and nose) filled with MDF dust I had my cabinet shell. After the glue set, Brandon and I applied wood filling and sanded, in preparation for primer. Before heading off to work, I applied one more layer of wood filler where needed. When I got home, Brandon and I did a final sand and began priming (Zinsser 1-2-3 Primer ). 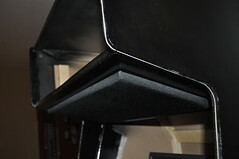 After another lighting sanding, paint (Rust-Oleum Gloss Black Enamel ) was applied. The mechanics of the cabinet were installed today. First the access doors, which I carefully cut out on day one. Then the air vent, which is just a standard $3 AC return vent from Lowes, painted gloss black. I cut the top of the control panel and glued on its supports. After I was sure the glue had completely cured, I began final work on the control panel. I sketched out a couple of control layout options, and settled on one that somewhat conformed to your fingers. Next, I put my hole saw through the most wood it had ever seen; cutting a total 18 holes. After sanding out the holes and test fitting the controls, I covered the front and top of the panel with vinyl. I figured it more durable than a painted surface and it would help conceal imperfections. 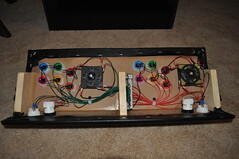 With woodwork, basically complete I spent the evening wiring up the control panel to the iPac controller board. 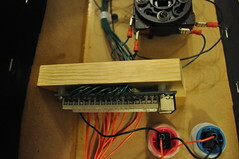 It was extremely easy to do, and my control board design worked out perfectly for wire routing. After completion I test everything out on the arcade PC to make sure everything was going to work. The dreaded day has arrived. We have to get this behemoth upstairs and into the gameroom…good thing I have sons! Once in place I began a rough installation of hardware. Within 30 minutes of it being brought up stairs we a gamer. It felt like I was reliving my days as a car stereo installer today, as I built a custom speaker cover for above the monitor. 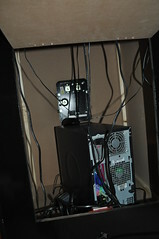 Once complete I installed it, and mounted the PC speakers and a Linksys Router behind the marquee. The Linksys is running as a wireless bridge, running DD-WRT. 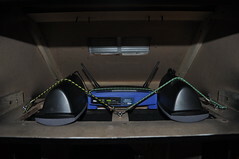 Both it and the speakers are mounted with simple bungees that enable me to quickly remove and/or swap out parts. I also installed the coin door and frame that arrived that day. Today I stopped by Lowes and had a custom piece of plexiglass cut to cover the monitor. After a little trim work, I had it and the monitor bezel installed. Marquee Graphic – I have not decided exactly what graphic I’m going to install in the marquee. I’ll likely design something myself and have it printed up. Marquee Light – The light I had bought was 1/4” too wide. My goal was to complete the cabinet before we hosted a pasta dinner for the Rockledge High School Cross Country Team. I made it by one day and it was totally worth it, as it was a complete hit. The result far exceeds my expectations. When I originally decided to do this, I set a budget of $250, but as I was building it I realized little features like the coin door and bezel would just complete the cabinet, so I splurged a little. All in all I spent around $340 and invested about 18-20 hours of labor.